The formula for cheesecake is pretty simple. Depending on the texture you seek, there are basic ratios of cream cheese, sometimes sour cream, sugar, vanilla or lemon and some eggs to lighten the density and set the cake. Sometimes just a little bit of flour is added to give it a cakey texture. The cheese can also be in the form of ricotta, farmer’s cheese, goat cheese or mascarpone, which all lend their own flavor and texture. If you beat in too much air, the cheesecake will soufflé and sink. A gentle and even oven temperature is crucial to avoid a dry and cracked cheesecake. 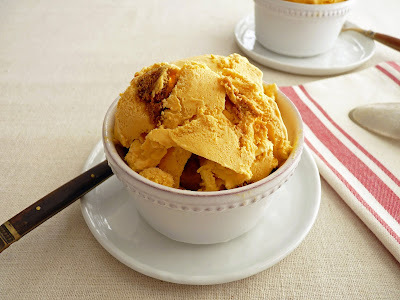 This is a seasonal Pumpkin Cheesecake Ice Cream, a chance to get all the flavor of cheesecake without any of the fuss of making sure it’s not over-whipped or properly baked or cracked. It's super easy to produce cheesecake in this form. You just throw everything in a food processor and blend. There are no eggs to worry about or a crust to shape. Like most cheesecakes, it isn't overly sweet; just a touch of lemon juice brightens the flavor. I used restraint when it came to the spices because I didn’t want to overwhelm the flavor of either the pumpkin or the tanginess of the cheese and sour cream, which can become muted after freezing. You can certainly adjust all these flavors to your own liking. Just taste as you go. 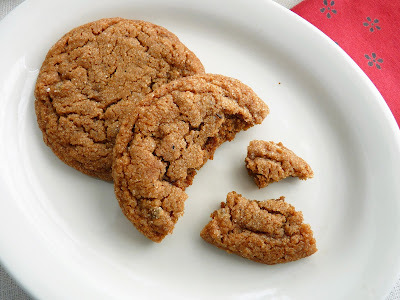 I also folded in some chewy Ginger Molasses Cookies that I chopped into small bite-sized pieces to add some texture and mimic the sensation of a crust. 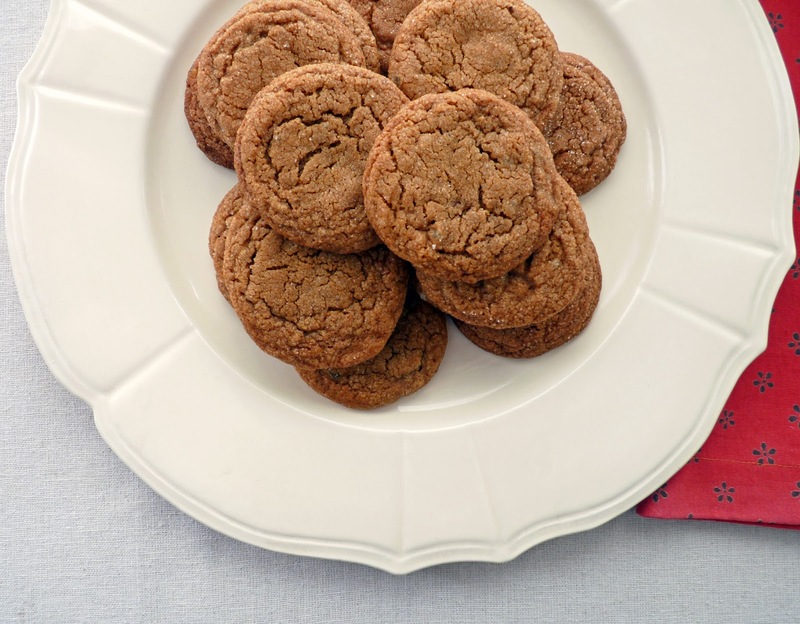 Use ginger snaps, graham crackers or your favorite cookie. Or leave them out if you wish. Here’s to the full flavor enjoyment of the pumpkin season! - Plan ahead so you can let the ice cream base chill at least overnight to allow the ingredients to co-mingle and ripen. I actually sort of forgot about mine and after 3 days, the flavors were much improved and superb. - Do have the cream cheese at room temperature so you don’t wind up with lots of lumps. - When your ice cream is finished, put it into an airtight container and pack it down to avoid air pockets where ice crystals can form. Pressing a piece of plastic into the surface also helps keep ice from forming on the surface. 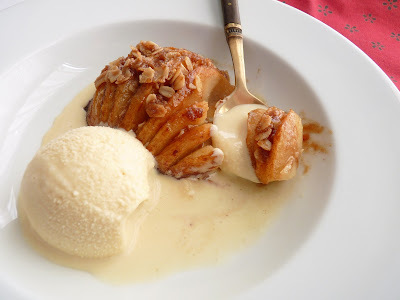 - Homemade ice cream doesn’t have any commercial emulsifiers and because there are no eggs and not a lot of sugar in this recipe, the ice cream freezes up fairly hard. 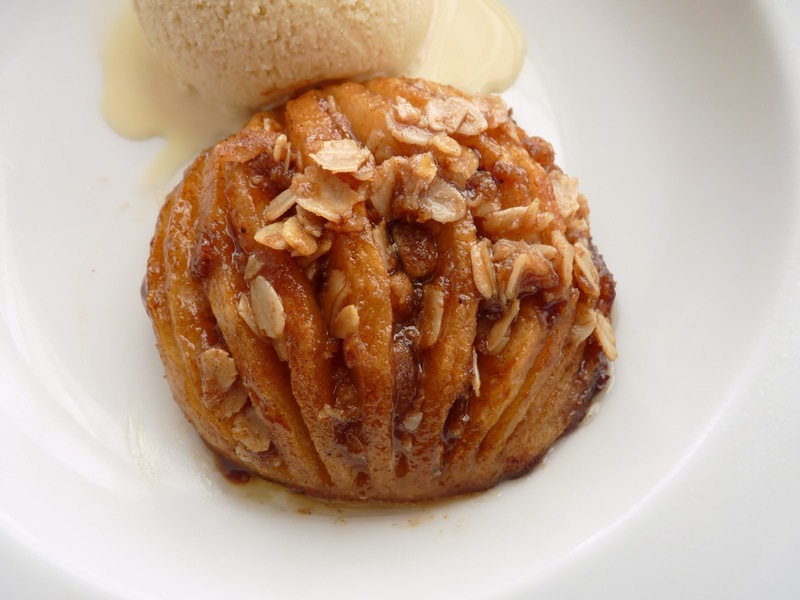 Let it sit at room temperature for several minutes to soften before serving. 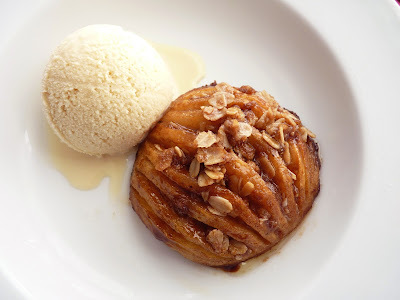 - Also try the plain Cheesecake Ice Cream and garnish however you wish. 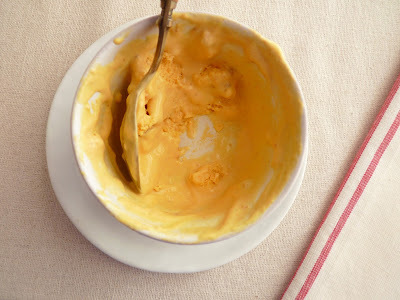 Place the cream cheese, sour cream, heavy cream and pumpkin in the bowl of a food processor and process until smooth. Add the sugar, salt, spices, vanilla and lemon juice and process. Taste and adjust for salt until you have a bright flavor. Pour into an airtight container and chill overnight. Chop or crumble a few ginger cookies into small bite-sized pieces. Freeze according to your ice cream machine’s instructions. 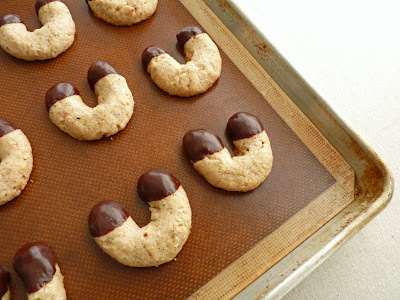 Fold in the cookie pieces. Pour into an airtight container. Press a piece of plastic wrap into the surface, cover and place in the freezer. To serve, let the ice cream sit for several minutes to soften before scooping. With apple and pumpkin pastries in good supply, it’s also absolutely a good time to roll out ginger cookies. Everybody knows it wouldn’t be fall without them. Spicy, chewy and crisp, they pack a real burst of flavor to remind us just how pleasing a little sugar and spice can be. They are impossible to resist. Ginger is a delicious and powerful ingredient in all its forms. It comes from a flowering plant indigenous to China and has long been a central ingredient in Asian and Indian food. We now find it enhancing cuisines all over the world. In America, it's also a part of the pastry and beverage universe. Molasses is a by-product of the sugar refining process. The first syrup produced from boiling the juices of sugar cane is called cane syrup. Molasses is the product of a second boiling. Blackstrap molasses is the very strong and slightly bitter result of a third boiling. 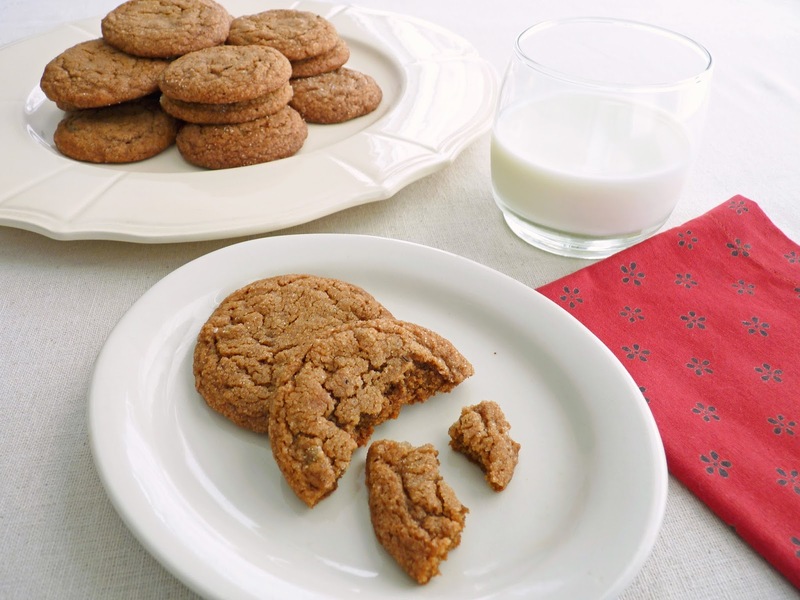 Of course, ginger cookies also appeal to us because they are full of lots of strong spices. In this batch, I add a heady mix of ground ginger, cinnamon, allspice, cloves and nutmeg. This means your kitchen will be filled with quite an intoxicating aroma as you slide them into the oven and let them do their magic. If you have a cookie jar, I suggest you fill it with these cookies ASAP. After all, it’s October and nothing says autumn like Ginger Molasses Cookies. I'm definitely feeling it. 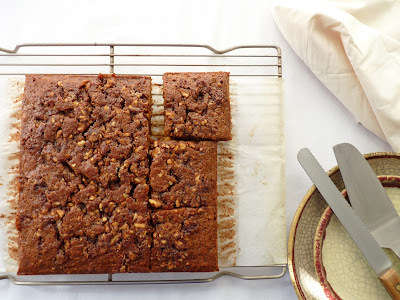 - I always use Grandma's Molasses for baking. - A #40 ice cream scoop is great for portioning the cookie dough. This produces 36 2 1/2” cookies. - I like my ginger cookies soft and chewy in the center and crispy at the edges so I baked mine for 11 minutes. For crispier cookies, bake them another minute or so. Since all ovens are different, I recommend baking just a couple cookies first to get the timing right for your idea of perfect texture. 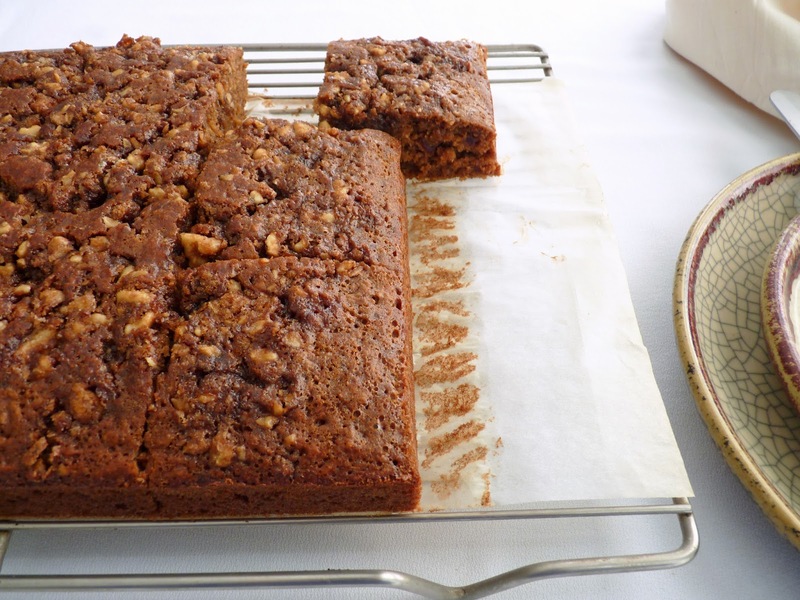 Let them cool for about 5 minutes, taste, judge and then carry on. - If you want to crank up the heat in these cookies, toss in a couple tablespoons of fresh grated ginger when you add the molasses. 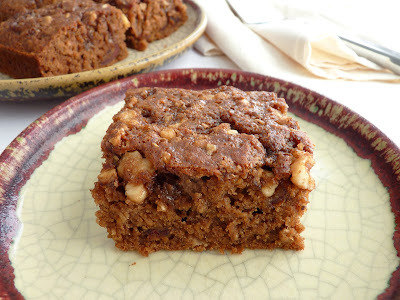 - I also recommend the easy and sublime Gingerbread Bars. If you like chocolate mixed with your ginger, try Ginger Chocolate Cookies. 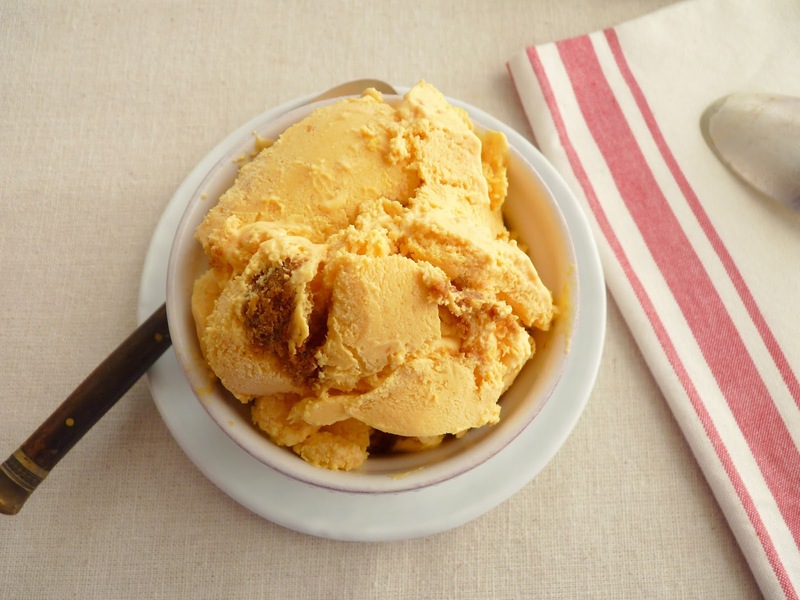 Ginger Cream with Blueberries is a creamy pop of ginger as is Ginger Ice Cream. Cream the butter and both sugars until smooth. Scrape down the bowl and add the egg. Beat until fully combined. Scrape down the bowl and blend in the molasses. Add the flour mixture and the minced candied ginger and mix just until there are no streaks of flour. Chill the dough until firm, about an hour. Place 1/3 cup of sugar and a pinch of cinnamon and allspice in a shallow bowl. Scoop or portion the cookie dough into 1 1/4” balls and roll in spiced sugar to coat them evenly. Place 12 on each prepared baking sheet. Bake until the cookies are light brown, puffed and cracked on the surface and just set around the edges, about 11 - 12 minutes, rotating the pans halfway through the baking. Place the pans on a wire rack to cool. It’s the moment for cookie making. Right about this time of year is when I start to think about the holiday pastries in my repertoire and what kind of experimenting and developing I want to do to keep things interesting for the season. This is another very simple nut cookie that has a crisp and light quality along with the added bonus of a little dip in chocolate. The cookie is flavored with almonds and vanilla and a touch of cinnamon. I also include a small amount of unhulled sesame seeds for added texture and flavor. The dough is mixed in a food processor so it’s quick and easy once you assemble all your ingredients. Speaking of assembling ingredients, I ran across an article on how to approach recipes and time spent in the kitchen. It really rang true for me so I thought I’d recommend it to you. It’s about visualizing your preparation of a dish before you begin. Anyone who’s ever worked in a professional kitchen knows this rhythm very well. You imagine in your head and think through the prep first before you even get started. You read the recipe a couple of times and you can see and almost taste the desired result. You think about the collection of ingredients and each step you need to take to get to the final product. Organizing yourself in this way makes it much easier to actually cook or bake and it helps prevent any last minute surprises. It makes the whole thing that much more pleasurable and builds your confidence about what you’re doing and why you’re doing it. I find this especially true for pastry. Check it out! 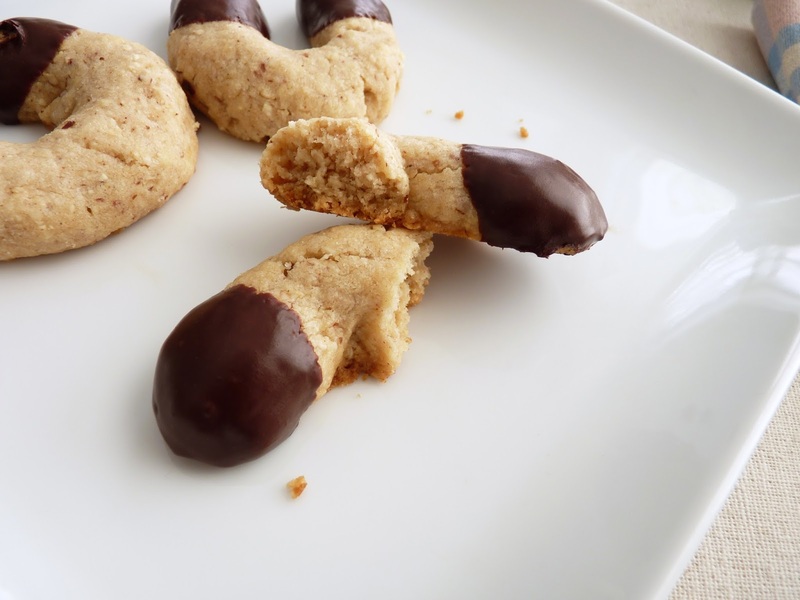 You can shape these cookies any way you’d like. I went for a horseshoe as a symbol of good luck. 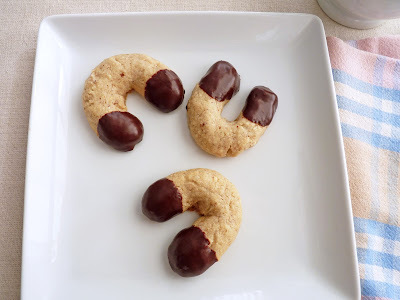 I think finding homemade cookies in your midst does happen to feel quite lucky, especially when it's a simple nut cookie dipped in chocolate. 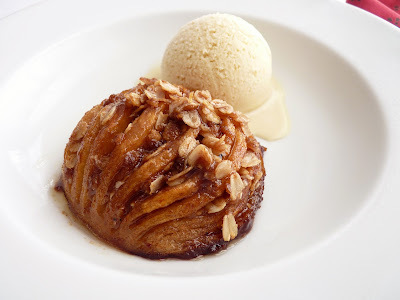 - I like to use sliced almonds because they grind to a finer crumb. To toast them, spread them out in a single layer on a baking sheet and place in a 350 degree F oven for about 5 – 7 minutes. Watch them closely as they will burn quickly. - A #40 ice cream scoop helps to portion the cookie dough. - When shaping the dough into logs that form the horseshoes, make sure the pieces are the same thickness from middle to ends so they will bake evenly. 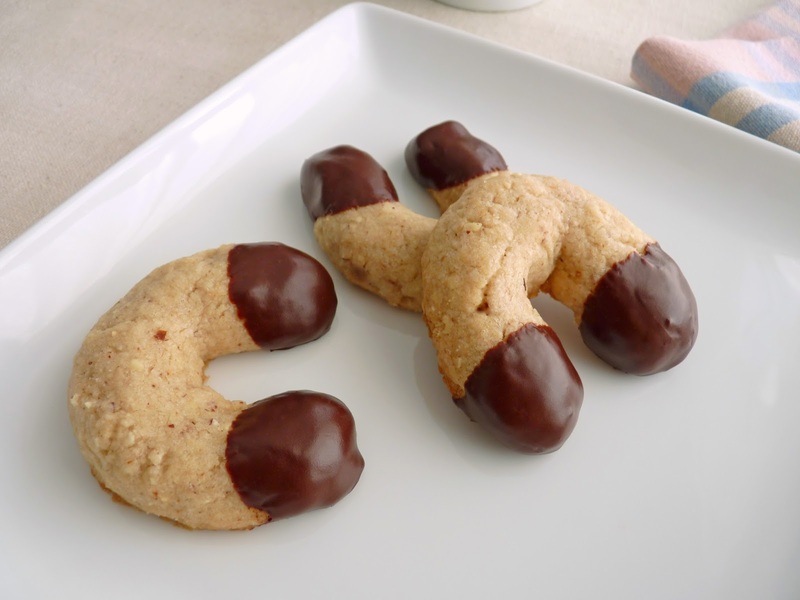 - I shape the cookies into horseshoes on the baking sheet so I don’t have to lift and move them. - I recommend semisweet chocolate for the coating because the cookies aren’t terribly sweet. Place the flour, almonds, seeds, sugar, salt and cinnamon in the bowl of a food processor and process until the nuts are finely ground. Cut the cold butter into 1/2” pieces and add to the flour mixture along with the egg yolk, vanilla and almond extracts. Process until the mixture collects into damp clumps. Place the dough in a bowl and cover it tightly. Chill for 2 - 4 hours or until the dough has firmed up enough to handle with ease. Portion the cookie dough into 1 1/2” balls. Then form each one into 3 1/2” logs of uniform thickness. Place them on the prepared baking sheets and shape each one into a horseshoe. Bake until only slightly colored on the top and golden brown on the bottom, about 15 - 17 minutes. Rotate baking sheets halfway through to ensure even baking and browning. Remove and place on a wire rack until cookies are completely cool. For the chocolate coating, finely chop the chocolate. Place in a heatproof bowl with the butter and melt over a pot with an inch or two of barely simmering water, making sure the bottom of the bowl isn’t touching the water. Stir to thoroughly combine. Remove from heat. Dip the ends of each cooled cookie into the bowl. Scrape the excess from the bottom of the cookie against the edge of the bowl and place on a wire rack or silpat to dry.